Are Your McDonalds Teenie Beanie Babies worth thousands of dollars? Are Your McDonalds Teenie Beanie Babies worth $$$$$ thousands of dollars? McDonalds Ty Teenie Beanie Babies Collectors are getting very excited, even anxious, about the possibility of having a fortune in their possession in the form of McDonald Teenie Beanie Babies, particularly the ones on cards. Sellers are adding fuel to the fire, announcing “RARE ERRORS”. Others see and copy. Here are some auctions as of 12th March, 2018. Are they really worth this much? No!! It’s a MYTH, but don’t shoot the messenger! As with any auction, just because a seller lists at that price, it doesn’t mean they’ll get it. Check it out for yourself. 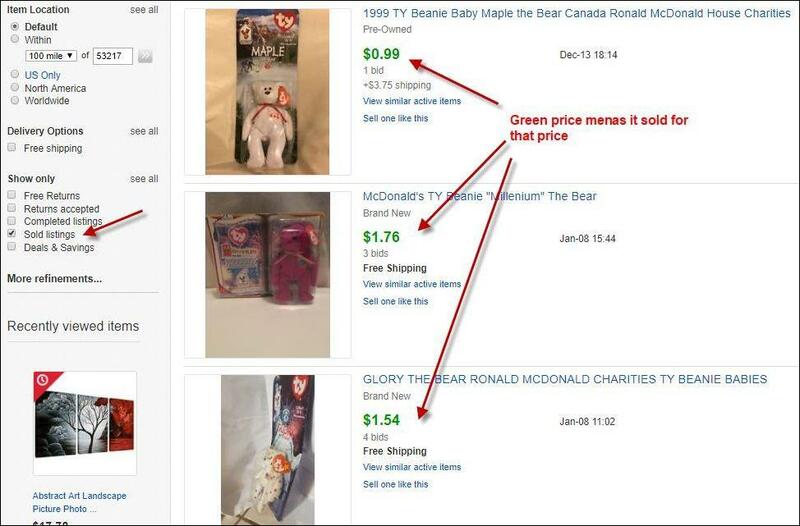 Go to eBay COMPLETED LISTINGS for McDonald Teenie Beanie Babies and see how many prices are in black text because they have not sold, even for a few dollars. Now go to SOLD LISTINGS and see what price the customer paid. It is a very different picture. You can apply this method to any item you are researching on eBay to know the true value of it. As they say, an item is only worth what someone is willing to pay! The year being different on the tag and the box of a McDonald’s Teenie Beanie isn’t an error. The year on the tush tag is when “Beanie Babies” was copyrighted. It was printed that way on all of them the first few years. The spelling of Oakbrook and Oak Brook being different on McDonald’s Teenie Beanies is an error but was printed that way on all of them on cardboard packaging so is not rare or valuable.